About once a month, I need a good girls night with my girlfriends and I LOVE hosting (hostessing?). With Halloween right around the corner, a spooky-themed girls night in, where we could hang-out, eat healthy treats, watch a movie and just laugh for an entire kid-free evening of fun and much needed girl time. I decided to have “Ghostbusters” themed movie watching party because the New Ghostbusters movie is FINALLY AVAILABLE on Blu-ray, DVD and 4K Ultra HD. The Extended Edition of the movie also has 15 more minutes not seen in theaters and 3 hours of hilarious extras. I think it’s the girls night/Halloween movie of the season, (because so many of the hilarious SNL female cast members are starring in it) and ANYTHING with Kristin Wiig is going to be hilarious. Because our Halloween theme for this year is Arabian Nights (yes, we do themed halloween over here), I’ve spent the entire month turning my house into a jewel-toned palace. I purposefully hadn’t gotten any spooky decor out all month and I was having some serious traditional Halloween remorse. This was the PERFECT excuse to break out of the theme for a few days and let my love for traditional Halloween decor show. For this movie night, I wanted keep the party feeling grown-up and really go all-out with the Ghostbusters theme, menu and decorations. Make sure to read all of my tips and tricks for using your own Halloween decor items to set up an effortless and affordable Ghostbusters or Halloween themed soiree. When I only have a handful of girls getting together, I tend to go a little fancier with the tablescape and decorations. Personally, I have more fun when it feels special and intentional and honestly, I prefer it that way. For the tablescape, I used a bright green silk table cloth, topped with a black frayed mesh runner, three large skull placemats (from the dollar store, score! ), two black wire pumpkins with mason jar candles and a flower arrangement with a few large black ostrich feathers and a printed Ghostbusters logo (I found online) in the middle. 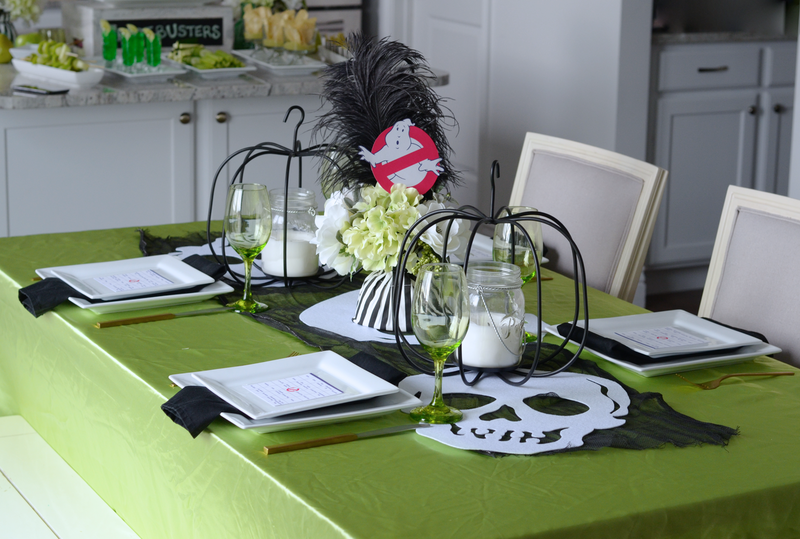 To tie in the theme I created place settings for each guest, I used square plates, black cloth napkins, green stemware, gold silverware and a Ghostbuster bingo card (grab my FREE printable below) to play while we watched the movie. I used bat placemats (taped to the wall), a skeleton garland, two candelabras, spooky pictures and a “trick or treat” sign to tie in the family room decor. Having something to do at your party is always a good idea, but keep in mind, most girls nights are for munching and chatting. Watching a movie is a good activity but don’t be surprised if you and your friends talk throughout the entire thing. I created these FREE Ghostbuster printable bingo cards HERE for us to use while we watched the movie. Make sure to have a little treat or prize for those who get “bingo”. I had “Ghostbuster slime” colored nail polish bottles for each guest, but anything little would work great. If you’ve been following me for a while, you know I’ve all about having healthier treats at my parties to keep myself on track with my health and fitness goals. At first I felt super awkward as it was pretty unconventional and I didn’t want to ruin the traditional junk food fest that IS girls night. But I was really surprised to hear from my guests how nice to was enjoy every party of girls night without using a “cheat meal”, feeling great and not missing the sugar high and crash from all of the junk. And lets be honest, just because something is “healthy” or “good for you”, it doesn’t have to be disgusting. It’s not like I’m serving steamed broccoli and brussels sprouts, which I actually wouldn’t mind… But you get the point. Another way to add some fun is to use the menu and food as decor and to make it match your theme. Make sure to use a mix of different shapes/sizes of plates, add different levels/heights and use elements from your party theme to tie it all together. Here are some creative ideas (some I found on Pinterest) that I made my own. The green Ghostbuster themed menu included: Green fruit skewers with green grapes, kiwi fruit, honeydew melon balls, Granny Smith apple chunks and a lime wedge. I had sugar-free green jello shots aka Ectopalsm, a green veggie tray with celery sticks, cucumber slices, zucchini sticks and green dill and feta dip. I served wasabi-ranch snap pea crisps, hint-of-lime chips with my easy “Slimer” guacamole salsa (recipe below), fresh green smoothies topped with a frozen banana ghost and of course, popcorn. 3 Halved Frozen Bananas, with two whole cloves used to look like eyes. Cut in half, add the “eyes” and freeze on a flat tray until ready to use. Combine all ingredients into a blender and pulse until well blended. Add two tablespoons of guacamole salsa to the bottom of a miniature trifle dish. Add a handful of chips on top. Serve and enjoy! When setting up for a party, sometimes I’m able to solicit help from my daughter… Sometimes. But after she gets bored, I’ll have her sit quietly and enjoy some screen time while I do my thing. It comes as no surprise that I am almost ALWAYS going over on my data plan. Correction… my daughter is always using my data while watching those kid unboxing toys videos, (please tell me you know what I’m talking about!) ha! So while I was at Walmart grabbing my party supplies and Ghostbuster DVD, I started looking at the cell phones and plans they had. I ended up grabbed a LG K7 which is also on rollback at Walmart for only $49.88!! (Rollback from $89.88!) and purchased the Walmart Family Mobile PLUS Plan with Unlimited Talk, Text, & Data which includes up to 10GB of 4G LTE. It’s perfect for watching all of those extra shows, plus it includes a free movie on VUDU every month ($7 value) per line for $49.88. With the starter kit on rollback for $19.88 (from $25), my out of pocket was really low compared to other prepaid carriers – only $19.88 to get started! They also had a special set up with a fun virtual reality Ghostbuster experience they were offering in-store as well. You can find this phone at the Walmart Family Mobile entertainment area in-store and that they can help you activate a new line and you’ll also get the free Ghostbusters Virtual Reality Experience. Look for the brochure with details on plans and the VR experience + a plastic 3D hologram. Check out the Walmart Family Mobile Hub page to find an event in your area where you can access all of the above features and experiences! I had a lot of fun with this party and it was great to catch all of the inside jokes and see some cast members from the original Ghostbusters movies. What are a few of your favorite ways to make a girls night unforgettable? This is so pretty – what a great idea for a girls night!